Visitors to Branson can still enjoy the cold season as there are tons of indoor fun activities that you can find at any time of day. Many of Branson attractions that can keep you going with some exciting activities include indoor parks that offer many fun-packed thrilling water rides and indoor zoo and aquarium that showcase some of the world’s exotic and intriguing sea and land creatures. These Branson attractions that can give you fun under the roof include the White Water Park, Splash Country Indoor Water Park, and Branson’s Wild World. If you want to go out and breathe some fresh air, take advantage of visiting indoor water parks and other facilities that offer thrilling indoor fun activities and other thrilling water rides. With the mild temperature in Branson during winter, you still have the chance to visit entertainment spots, museums, and other tourist attractions. Aside from being the most visited vacation destination in the Ozarks, Branson is also known as a world-class entertainment hub. It is also perfect for vacationers who want to enjoy indoor fun activities during the cold season. White Water Park at Silver Dollar City is the best park to spend great water fun activities in Branson. If you want to reduce the agony of winter blues, why not visit the park and enjoy an array of exciting attractions and water fun rides set on 13 lush acres. This huge water park in Branson features 2 million gallons of water of fun rides and many other exciting water activities. Here you’ll enjoy the tides of 500,000 gallons of wave pool, the gentle flow of the Aloha River, Splashaway Cay, and Coconut Grove. The park also features other park rides such as the heart-pumping thrill slide KaPau Plummet that slides down on a 240-foot, 70-degree plunge followed by a spiraling loop before it splashes down. The Splash Country Indoor Water Park at Grand Country Resort is also one of Branson attractions that offers great indoor water fun activities. 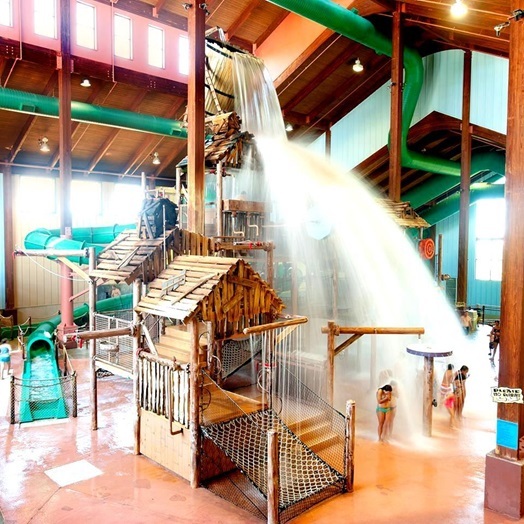 Set on a 20,000 square feet facility, this relatively small indoor water park features interactive treehouse water play structure that serves as the launch pad for the two slides of the park. This park also offers some outdoor water park fun with more slides and exciting attractions during warmer weather. This indoor park also features 2,000-square-foot toddler pool and a 250-foot lazy river attraction. Other indoor attractions at the park include whirlpool spas, tube slides, lazy river, and activity pool. Combined as a zoo and aquarium, Branson’s Wild World is a unique indoor facility where you can get the chance to see tons of sea and land creatures including the aggressive bull shark, dangerous snakes, and many more. This fascinating indoor Branson attraction also features a 3D Blacklight Mini Golf where you can putt your way through 9 holes. So, if you want to enjoy great indoor fun activities at any time of year, be sure to visit some of Branson’s indoor facilities that offer all kinds of indoor activities including thrilling water rides.